Sponsored by Brylane Home and hosted by Mom Does Reviews and her fabulous blogger friends! This fun giveaway is to celebrate Mom Does Reviews 40,000 Facebook fans! We love any reason to have a giveaway, I think this is a great one. This festive pre-lit Christmas tree displays a dramatic range of color with green tips, 20 fiber optic faux-candles and 158 energy-saving LED fiber-optic tips. easy assembly, simply place tree on stand, fluff branches, plug in and enjoy! dimensions: 59″H x 27½” Diam. BrylaneHome also offers pre-lit wreaths that come in beautiful, lush looks. 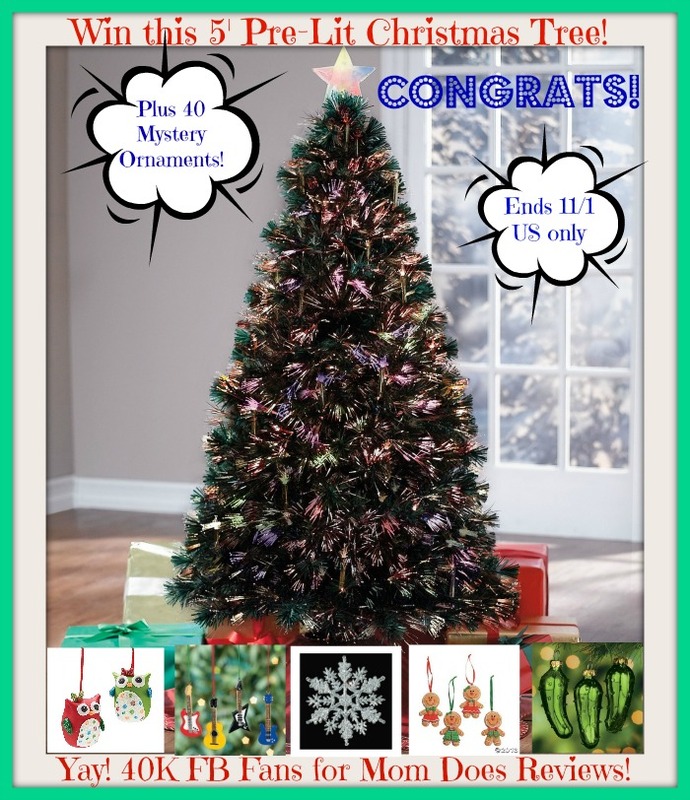 One lucky winner will win this amazing tree AND 40 mystery Ornaments!! They could be snowflakes, they could be penguins or owls or they could be pickles!! You won’t know until they arrive! We have made it super easy to enter! Just fill out the rafflecopter below. Be sure to complete the mandatory entry! If you don’t comment, you can’t win. We will be checking. The participating bloggers were not compensated for this post. We are not associated with any of the companies named above. No purchase is necessary to enter. Void where prohibited by law. The odds of winning are based on the number of entries received Open to the Continental US 18+ only. Confirmed Winner(s) (by Random.org) will be contacted by email. Winner(s) have 24 hours to respond before a new winner is chosen. The sponsor(s) will be responsible for product shipment to winner(s) of this giveaway. My blog is not responsible for product shipment/delivery. This event is in no way administered, sponsored, or endorsed by, or associated with, Facebook and/or Twitter, Google, Pinterest. This disclosure is done in accordance with the Federal Trade Commission 10 CFR, Part 255 Guides Concerning the Use of Endorsements. When I was a child, I got one special ornament each year for my own Christmas tree. Those are my faves. Of course all the handmade ones but my first ornament with my hubby is my favorite. My favorite ornaments are the ornaments that we get every year for the kids. We get personalized ornaments every year. It’s nice to look back every year and see how their favorite things have changed. The ones I made in grade school for my mom and dad , that they still have and put up every year…..Also the one for my son’s first Christmas ! Most of our ornaments are special and have meaning behind them. Every year we buy a new ornament that reminds us of a memory from that year. The kids remember each ornament and why we picked the one we did. Well, I had ornaments that meant alot to me. I had some of my Moms and some when I was a child and some I bought through the years. I lost everything we owned in storage a couple years ago so we are starting fresh. My favorite would be the paper one my grandson made last year 🙂 Its just perfect! It is made with 100% love! My favorite is the Strawberry Shortcake ornament my mom bought me when I was younger. we don’t usually do ornaments, just lights! My favorite ornament is a angel. Every single ornament we have is very special to me as each one has a meaning behind it. There is My First Christmas, my sister first, my fathers, other various family yearly ornaments, my first married one. My favorite is a little picture frame with my sons first christmas photo inside!! Love a bulb that was my grandmothers, makes me happy. The handmade ornaments my kids made me when they were little with their pictures on them. I have a pretty, glittery, glass cupcake from my friend who knows how much I love cupcakes & sweets! My favorite ornament is snoopy with his dog house covered in Christmas lights! my fav ornament is the angel. Angels are so pretty and just makes the tree so pretty. my first-born son’s ‘First Christmas’ ornament w/ his newborn picture inside…it was a special Christmas. A red glass ball with glitter my son made. I have all my ornaments from when I was a kid that I still put on my tree. I would say they are all my favorites! I have 2 paper wreaths that have been laminated; my son made them when he was very young and they have his hand prints on them. Very sweet. The one’s my daughter made. My faves are the ones I got my 1 year old daughter! The ones my daughter has made. My favorite ornament is a little angel holding snowflakes. It was from my Grandpa which is really sentimental to me. My favorite ornament is the one my kids gave me with their picture in it. My favorite ornaments are the ones my daughter makes for me in school. My Mother had some pearlized glass orbs that I place over some lights on the tree, so that it glows their colors. I feel connected to her whenever I decorate and admire my tree. I love angel and star ornaments. They remind me how important family is. I love the star or angel on the top,it stands for the heavens announcing the birth of Christ. My favorite ornament is a handmade white dove ornament that was given to us when my grandmother passed. It has meaning to me! My best friend gave me my best ornament. It is a little Hallmark House that says our first Christmas together and it has our names on it and 1995. I keep it out year-round. It is one my husband carved for me when we were first dating. It’s not glamorous but it means a lot to me. My favorite ornament is one my daughter made in preschool. She hates it. :( Now that I am a grandmother I am hoping for one from my grandson. I love our tree:) when my husband and I first started dating I decorated his house with a tree and stockings while he was at work. Every time I bring the tree I remember the look of surprise on his face when he saw out tree. My favorite ornament is the Hallmark one we bought for our angel after we lost her. I love ornaments with photos on them because it’s very personal. My kids first Christmas ornaments. cute ones with out names on them for each Christmas season! My favorite are the Frosty Friends Hallmark Ornaments. I try to add a new one each year. I have a gingerbread ornament that I made in Kindergarten – over 40 years ago. It’s irreplaceable. Mine is an ornament my best friend gave us as a shower present with our names on it and the year. When I see the ornament it just brings backs tons of memories of that special time in our lives. I bought a big metal heart back in 2001 before my first daughter was born that said Our First Christmas and it had a big blue beautiful bow on it and I just love it. It was our first Christmas as a family. It was so nice. My favorite ornament is a glass heart wrapped in lace with a little rose on it. My grandfather gave it to me and I love it! My favorite ornament is very old and fragile. It is an angel with a plastic body and paper wings. It was my grandmothers and was always on her tree when I was a child. It has seen better days but I still think it is beautiful. I have an ornament of a moon with a child sleeping on it. it was my very first ornament my mom gave me and its very near and dear to my heart. The Angel my son made when he was 5. So pretty . I would love this for the Christmas season. My favorite ornament is a ‘make a wish’ ornament. My grandson was 4, and we talked about what the “Make a Wish’ Foundation was about, and I showed him the ornament and said that I was thinking of buying it because it was beautiful and the money went to the foundation He got an allowance for doing chores, and he saved up his money to surprise me with the ornament, and even had it engraved with a special message. That was 4 years ago, and he’s just as thoughtful and giving today as he was then, and he still donates some of his allowance to causes to help make the world better. When I was a young girl (long time ago) my mom had these beautiful glass ornament. They were of this very delicate lite glass and they were decorated beautifully with white lacy looking designs. You could tell they were old and she kept them in the old box they came in. I remember every time one broke she would look so sad, but we had animals and all. Eventually they all broke but I loved those ornaments. My favorite Christmas Tree ornament is a wooden reindeer with a simple red ribbon. It is significant to me because this was my husband and I’s first Christmas ornament given to us by his mother when we were first married. It reminds me of when we had very little but love and holiday spirit. I have too many, the ones from family and friends mean alot to me. My favorite ornaments are the ones my daughters have made for me! Especially the ones that have their school picture on them. My favorite ornament is a picture of my son that he made at church. The special meaning behind it is that it’s from my son’s heart!!! Well, it’s not really an ornament, but there is the Christmas tree skirt that we had since I was very, very young. It was white with a red tie, all in felt, with various Christmas-y decorative cut-outs (back in the day when you had to cut out the pieces from single color pieces of felt or cloth, not something that was printed with all the pieces on the same cloth). A friend of the family (we called her ‘Aunt Betty’) glued and sewed the pieces on, adding beads, glitter and sequins. She put on a ballerina especially for me and a train (?) for my brother. My favorite Christmas tree ornament is a Mother/ Daughter sitting around a Christmas tree drinking hot cocoa and admiring the tree – it is special because it was given to me by my daughter when she was young, and now that she has her own family, and no longer spends that much time at my home, it reminds me of the Christmas’ we shared when she was little. My grandma made me a box that she would put kisses in. My favorite ornament is a Sugar Bear ornament from a box of cereal from 25 years ago. All of my kids loved to play with it. It brings back so many Christmas memories. My favorite Christmas ornament has 7 Teddy Bears wearing Santa Hats. Each Bear is named for every member of our Family. It’s our Family Ornament. It will always be my favorite. My favorite ornaments are a group.. every year since my daughter was born (2009) my husband and I have taken her to the little place in the mall that does the personalized ornaments. Each year we get a new personalized one with our names and the year! My favorite is a Winnie the Pooh that I’ve had since I was little. I have been collecting Christmas stockings for over 30 yr. and I have many! If I can fit them, my awesome daughter and I hang them all up. It is very festive and everyone enjoys seeing them all. I can’t pick just one. Growing up my Mom & I bought each other an ornament every year. When she passed away 9 years ago I got all of the ornaments that I had ever given her. I put them ALL on my tree EVERY year! They remind me of her! My favorite ornament is the one my daughter made about 25 years ago in school. It was an angel made out of a walnut. My favorite ornaments are the ones my kids made. They are special because they made them just for me with their little hands. My favorite part of the tree is the lights. I don’t use too many ornaments. my favorite ornament is a bear that has my daughters name on it and the date of her first christmas. I have 6 favorite ornaments! Our first Christmas together ornament, our first home ornament, and one for each of my kids first Christmases! My favorite ornament is one that my mom gave me years ago. I have since lost her to breast cancer. We have a little Gingerbread House that says “Our First Christmas” and my mom gave it to my husband and I, the first Christmas we were married. I love all of the ornaments my kids have made but I also have a Barbie bride I got when I got married. Love it! Mr. & Mrs. Snowman, with our wedding date on them, we treasure this special Christmas ornaments, always hang them at eye level. A small santa made of yarn. It belonged to my grandmother. My favorite ornament is a ceramic snowman. It’s special meaning is that I made it in the 1st grade. LIttle sleds painted red my kids made over 30 years ago together out of popsicle sticks. Very sentimental to me. My favorite is a large white Dove that I put on my tree every year. It was my mother’s and it was her favorite. My favorite ornaments are ones my aunt made that are little mailboxes with addresses of all the homes I’ve lived in. I have many ornaments that were from my childhood. My Grandma bought me (or made me) a new one each year. I cherish every single one of them equally! My favorite is a group of ornaments given to me by my son and husband.